German tyre company Schwalbe has created an Airless System that dispenses with a puncture-prone pneumatic tube and uses instead BASF thermoplastic polyurethane. This is the same material that is used in the soles of Adidas Boost running shoes, reports Bike-eu.com. The system – which also includes the outer tyre – requires fitting by a bike mechanic. "Solid" tyres, tyres with inner foam cores and even tyres comprised of springs have been much trialled since John Boyd Dunlop (re)invented the pneumatic tyre in the late 1880s, but such flat-free products have stubbornly refused to set the market alight. However, with the advent of dockless bike share bikes the acceptance of such products has been on the rise. 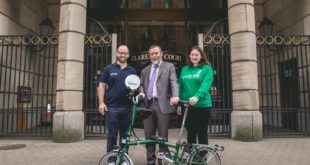 Last year, BikeBiz reported that the bike share boom was "spurring innovations in dockless tyres". Germany’s BASF, Dow Chemical of the US and China’s Sinopec are all eyeing up opportunities to equip the third and fourth generation of these bikes, which have flooded into Chinese cities and now becoming almost as commonplace in the US and Europe. BASF has developed Elastopan, a polyurethane microcellular foam, for the dockless bikes, and wants to expand outside of this sector to "normal" bikes. Dow Chemical has produced a PU tyre for Mobike, China’s second largest dockless firm. Sinopec has developed a styrene-ethylene-butylene-styrene foam tyre, and has been unable to keep up with demand, noted ICIS News. 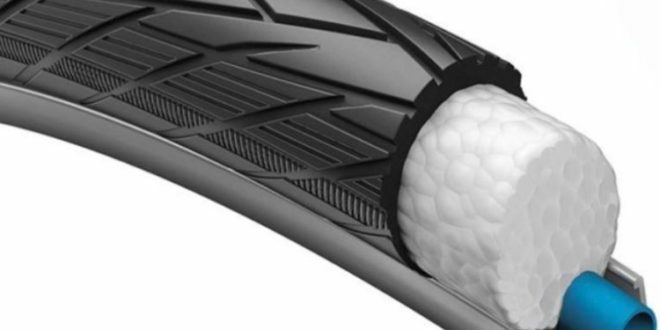 Other Chinese chemical companies are working on thermoplastic elastomer (TPE) bike tyres. Tannus first started work on its locking-pin airless tyre system in 2003, with a European introduction in 2011. Greentyre has been making its "solid" tyres in Middlesbrough since 1992 (BikeBiz was at the factory opening, with the ribbon-cutting done by Michael Heseltine). Schwalbe’s Airless System uses E-TPU foam which consists of thousands of sealed air balls Fitting of the tires-and-tubes requires a workshop tool and can only be done by Schwalbe-trained bicycle mechanics. This training will start in May 2018, initially only in the Netherlands and Germany. The system consists of a 700x32c outer tyre with a flat-free inner tube of white thermoplastic polyurethane and a proprietary ring which ensures compatibility of the system with different rim sizes. The system is suitable for rims with a rim width of 19mm to 21mm. The system will retail for €84.90.